More Fun #88 (February 1943) - The Man Who Chased The Rainbow! 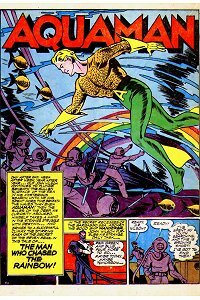 John Wilson has been diving around the world for mysterious purposes for longer than Aquaman has been living underwater, so Aquaman goes to find out why. Let's start with Blackbeard the pirate. While he's a huge part of this tale, he is only mentioned on the last page, and his real name is Edward, not John as the story says. He's the driving force behind Wilson's lifelong search: a hunt through the seven seas to find directions to a buried treasure. First: Blackbeard just didn't travel that far, so the whole "lenses buried around the world" thing is ridiculous. Second: Wilson wants to return the treasure to the descendents of Blackbeard's victims... how's he going to find them? Most of Blackbeard's victims were merchant companies. It'll take Wilson longer to return the treasure than it did to find it in the first place. For another flaw, look at the lenses themselves. Each one is hidden in a different sea, and each is marked by a nearby yellow pyramid. Ok. Drift, silt and mud, currents, sea life, and years would have made it literally impossible to find any of the pyramids or the nearby lenses. No wonder it took Wilson decades to find the first three. But the last four are insanely easy to find. Then... once he's got all of them... he has to look at Mars through them to read the words?!? Ok, I like the cameo by the Seal Island seals. And I thought Rocky was a decent standard villain. I like how Aquaman outsmarted him. And the hunt for the lenses itself was fun. It was also interesting to see Aquaman burning two ships, one of them underwater. But the flaws in this one. Ay-yi-yi! Finny Friends Report: A tiny seahorse "gossips" with Aquaman and lets him know that John Wilson is diving nearby. The seals from Seal Island (see More Fun #85) tip over Rocky's boat and keep him and his thugs away from their guns. Captured/Knocked Out report: Aquaman is never captured or knocked out in this story.